The year is 1413, and you inherit an island that is uninhabited becase, 70 years prior, Umur Pasha raided the island and everyone either ran away or were sold into slavery. You may petition the government to establish a fort, to keep the Turks away and protect the island. But then you may have to wait forever. You may, perhaps, pay for the fort, but forts are costly and unproductive: forts plant no crops and raise no livestock. You'd never get your money back. But if you are Zan Quirini, the solution is straightforward: you build a planned community. The community consists of duplex homes, two stories each, surrounded by a ring of three-story houses. The back-wall of the three-story houses is a very nice, solid fortress wall, hanging over precipices on all sides, with a couple of defensive towers. You then invite settlers from Mykonos and from Tilos, and you charge them rent for their nifty new homes. The Castle of Stampalia still stands on what once was the acropolis of Astypalaia. The people only left Quirini's houses in the 1950's because of earthquakes, and the Castle is now an open museum in which only the churches and the fortress wall have been kept in good condition. Zan's descendants appended "Stampalia" to their last name, in memory of the island they once owned. To this day their home, Palazzo Quirini Stampalia, is a public library and museum in Venice. The church of Saint George inside the Castle. 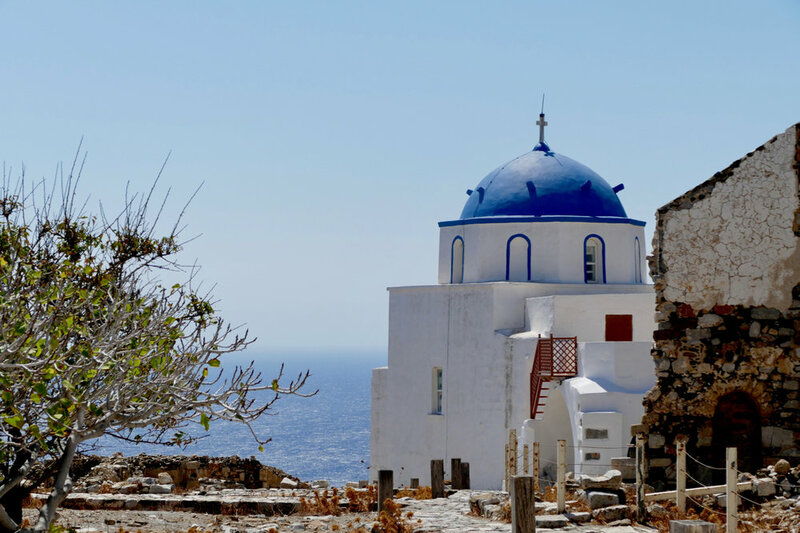 Stampalia (Astypalaia), Dodecanese. Leica Typ 114, 11 August 2018.